In this program student will learn about place value and its uses . They will learn how to implement the place value when it comes to reading the numbers. These young students will learn, understand and use purposefully the idea of place value. Do you want to ACE the GMAT and get into a top Business School? Getting a 99 percentile (760+) or even a 700+ on the GMAT requires not just understanding of math and verbal concepts but also a clear and smart strategy. Our instructor who scored a 770 on his GMAT and studied at University of North Carolina's Kenan-Flagler Business school has been training students to ace the GMAT for over 7 years. He has also created original content for the GMAT. His positive energy and enthusiasm will inspire you to reach new heights. We will work on not just general concepts of Math and English but those concepts that are typical to the GMAT. More than concepts out instructor will make a clear study plan for you, discuss the "Feedback Loop" and "Time blocks", strategies that are vital to getting a great GMAT score. 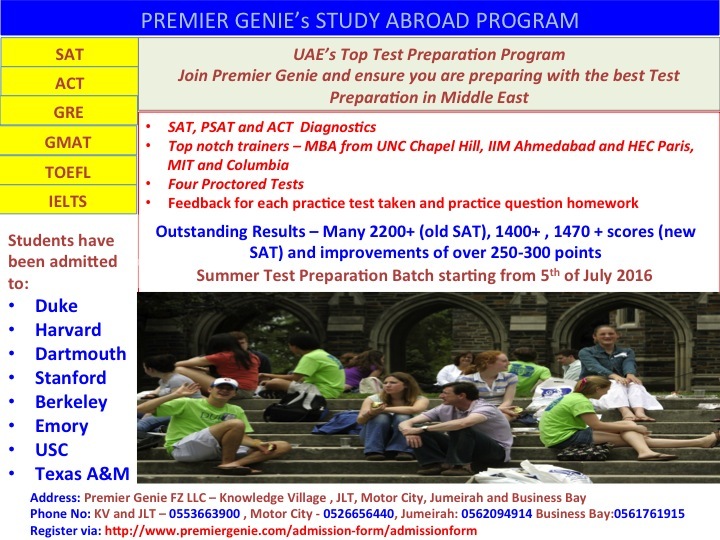 Call 055 366 3900 to request for a FREE consultation with our instructor who scored 770 on the GMAT. Planning to take the SAT? I really want to do well on the SAT, I know how much the test score matters. Is there a particular way to study to achieve super high SAT scores? If you are thinking any of the above we have guidance and answers. Our study abroad teams consists of MBAs from University of North Carolina, Chapel Hill, HEC Paris, IIM Ahmedabad and graduates from Massachusetts Institute of Technology. Abhishek Gurumadhva, who studied at University of North Carolina, Chapel Hill, will take you through not only Math and Verbal concepts that are needed to ace this exam, but also teach you unique strategies that are vital to achieving super high scores. Call 0553663900 to request for a free demo class in Knowledge Village, Dubai. In the demo class, Abhishek will detail the structure of the new SAT and introduce two key strategies that must be used so that you get a great score. He will also talk the prospective students through few math questions and some verbal concepts so that these students get an idea of his teaching style. Parents of prospective students are welcome to sit through the demo class. Call 0553663900 to get more information about how you can get that eyebrow raising SAT score! "Thank you so much for your help. Your contagious enthusiasm made me work harder. " "Your strategies really helped. Thank you very much"
Our IELTS program designed to provide holistic coaching in the English language so that candidates can gain admission in Universities of good repute in Europe, Canada and Australia. The program is also open for working professionals who wish to work overseas and require IELTS scores in order to migrate. In this Program student will learn about the actual mathematical relationship between addition and subtraction. They will get first hand experience of their mental calculation strategies. This program will teach the student to add and subtract the number using different methods like drawing,forward counting, backward counting and fingure method. In this program student will learn about addition and its uses when it comes to real life problems.They will learn how to add natural numbers using even more visual representations rather than just mugging it up by different methods like number line. In this Programme we will be discussing the various interactive methods of addition so that child can feel comfortable. In this Program student will learn about Subtraction and its uses when it comes to real life time problems through various classrooms activities and different methods like place value box method and number strips methods.The main objective of this program is to make student comfortable in subtraction and understanding of the inverse relationship between the addition and subtraction. In this Program student will learn about a three-digit number which represent the amounts of hundreds, tens, and ones; e.g., 706 equals 7 hundreds, 0 tens, and 6 ones. Understand the following as special cases: 100 can be thought of as a bundle of ten tens — called a “hundred.” The numbers 100, 200, 300, 400, 500, 600, 700, 800, 900 refer to one, two, three, four, five, six, seven, eight, or nine hundreds (and 0 tens and 0 ones). They will also learn and visualize how the value of a digit depends upon its place or position in the number. Whenever it comes to big numbers students fells a lot of trouble because of lack of automatic recall and they need to rely on laborious counting procedures creates a drain on mental resources needed for learning more advanced mathematics. In this program we will majorly focus on automatic recall of addition and subtraction facts, which develops in normally-achieving youngsters by about the end of this grade. Supplement your money unit with this lesson. Children will learn when they compare, count, and spend coins such as quarters, half-dollars, dimes, nickels, and dollars. This lesson also helps students practice counting by 2’s, 5’s, 10’s, and 100. After correctly counting their coins, children decide which item is most affordable based on the money they have – a crucial real world skill for young learners! Memorizing the basic multiplication facts, or times tables as they are sometimes known, is very important for your children. Unless these facts can be recalled automatically, students will struggle when learning more advanced math skills, not to mention the problems they may have conducting day-to-day transactions such as buying goods at a store. This programme deals with the basic multiplication tactics so that student can memorize it in a fun way.. In this program students will learn about measurements . At this level they will learn about the different categories of weight, length and even capacity. . Measurement is an essential part of our everyday life. Everything that we purchase, create, design, and build uses weights and measures. Weights and measures assure that medical diagnostics are accurate and that design and manufacturing processes are precise and consistent. Proper measurements are required to ensure that satellite and computer networking systems allow the world to communicate quickly, accurately, and effectively. This program is the perfect way for your kid to understand about length , weight and capacity and how to relate these concepts with the real world. Knowing how to tell time is a very important skill. Telling time is a skill often relegated to when we need to find the time status. But it is a skill as real-life and essential as addition and subtraction -- especially in the age of digital clocks. This Programme offers fun lessons focused on teaching kids how to tell time from digital and analogs watches. In this program student will learn about addition and subtraction and implementation of the same with the help of real time examples. They will learn in a drill and practice style. . This Programme is designed in such a manner so that kids will mastering the basic Mathematics facts in Addition and Subtraction. We will be dealing with different Strategies, Activities & Interventions to move Students Beyond Memorization. The goal of this programme is to master the student in Addition and subtraction typically by the end of the second grade. They will be learning these all through different practice activity like oral and written exercises, games and classroom and homework assignments. In this program student will understanding multiplication which provide them important tools for solving real-life problems and builds a strong foundation for proportional reasoning. The goal of this program is to provide the children with a quick overview of multiplication and its facts so that they can learn instead of memorize. In this program students will learn about the “Division” which is always a challenging math concept for kids. Keep this is in mind Premier Genie designed this program to help kids learn and practice simple division. In this program kids will be encouraged to apply their knowledge of basic division facts and find the set of numbers whose quotient is equal to the given number. Kids will enjoy and learn thorough different activities as they test and improve their division skills. This is a great program to help kids practice their math skills and develop their logical and reasoning skills. It is specially designed for the young mathematicians of today’s fast changing.